During the 17th and early 18th centuries, North American church bells were imported largely from English foundries, such as Whitechapel or Rudhall, while Spanish missionaries received bells from places such as Mexico or Peru. Evidence of church bell casting by known founders in the North American colonies, however, appears to have originated in Connecticut before the mid-18th century and continued in Connecticut during the rest of the 18th century before declining in the early 19th. The art of casting a bell for a church/meetinghouse in this period—a process generally unchanged since the 12th century—involved several steps. Following the preparation of a pattern or design to determine the shape and resonance of the bell, craftsmen poured molten metal (usually bronze or brass) into a loam mold, made up of an inner core and outer core, and allowed it to cool. After removing the mold, they sandblasted and polished the bell. They then tuned the finished bell by carefully removing metal from it as needed. Finally, the clapper or striker was inserted inside the top. 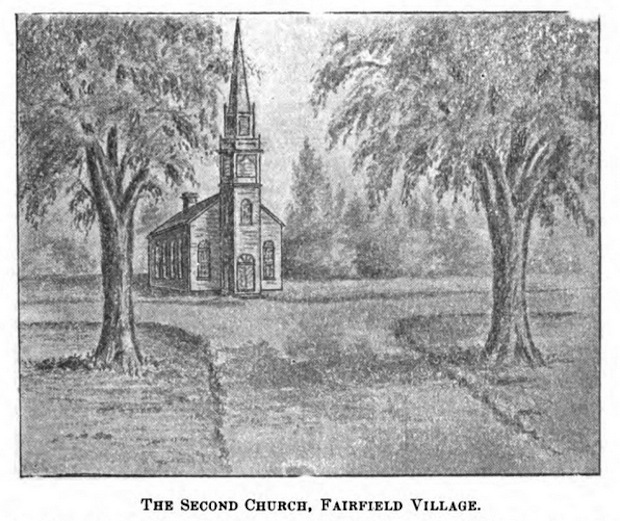 Illustration of “The Second Church, Fairfield Village” from the Annals of an Old Parish; Historical Sketches of Trinity Church, Southport, Connecticut, 1725 to 1898 by Rev. Edmund Guilbert, D.D. A church bell served many societal purposes during this period: to summon the worshippers to weekly church services; announce births, weddings, deaths, or executions; indicate the time of day and curfew; sound alarms for fires, floods, and other emergencies; gather people to hear the reading of official proclamations; as well as for a variety of other purposes. Abel Parmalee of Guilford petitioned the General Assembly for a 20-year monopoly to cast and sell bells in 1736, but the legislature denied his request and no evidence exists that he ever made a bell. The first person known to have cast a church bell in Colonial America was John Whitear of Fairfield, a man skilled in metals and clock making. He cast a bell for the new Anglican Church in Fairfield in 1739, for Christ Church in Stratford in 1743/44, and for the Congregational Church in Fairfield in 1751. His son, John Whitear Jr. succeeded his father in business in 1762 and cast a bell for the Congregational Church in Newtown that year. Isaac Doolittle of New Haven was a bellfounder as well as a prolific craftsman in many endeavors. He built the first printing press in the colonies in 1769, made the first brass wheel clocks, operated a powder mill during the Revolutionary War, and worked as a silversmith and instrument maker. As a bellfounder, he most likely cast the bell for Trinity Episcopal Church on the Green in New Haven in 1793 and did cast the bell for the First Congregational Church in Bristol four years later. Doolittle’s nephew, Enos, also worked as a clock maker and instrument maker, shifting more of his time to watch repair during and after the Revolutionary War. By 1788 he had formed a partnership with Jesse Goodyear in Hartford, casting bells for towns in Massachusetts, but no known church bells were ever produced. Enos and his son James began stocking bells after the three-year partnership with Goodyear ended, with many of these sold to noted silver and goldsmiths Ward, Bartholomew, and Brainard. This firm purchased Doolittle bells for Christ Church in Hartford in 1811 and for the First Church of Hartland in 1821. 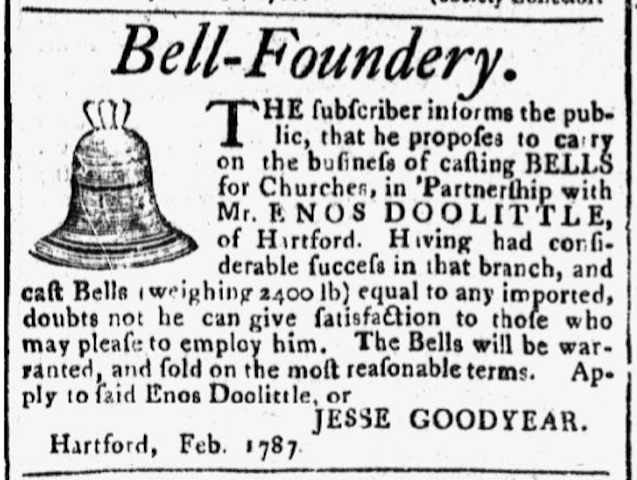 Advertisement by Jesse Goodyear in the Connecticut Courant, February 25, 1788, announcing a partnership with Enos Doolittle in a Bell-Foundry. 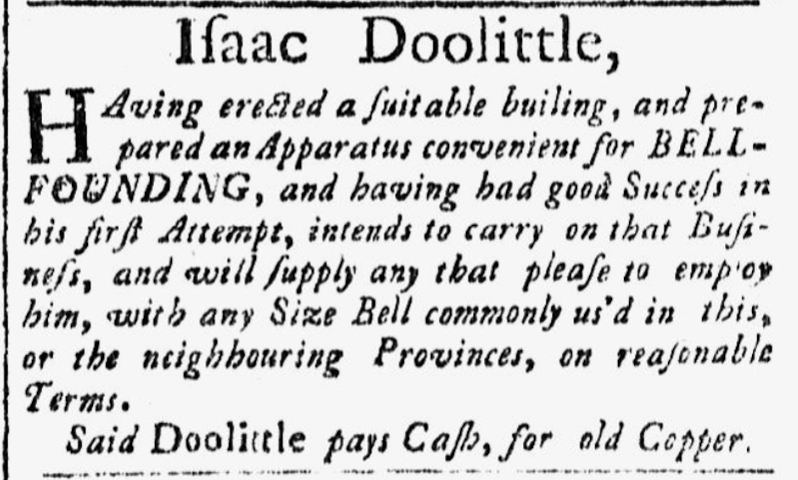 James Cochran acquired Isaac Doolittle’s bell business sometime around 1797, when Doolittle was in failing health. Cochran and his partner, Gamaliel Fenton, cast a bell for the First Congregational Church of East Haven in 1798. Benjamin Hanks was a noted clock maker who additionally made stocking looms (i.e. knitting machines), compasses, small metal objects, and church bells. While living in Litchfield, he cast a bell for its meetinghouse. He subsequently moved to Mansfield in 1790 and cast a bell for the First Congregational Church in Woodbury that same year. He also cast bells for the Abington Congregational Church in Pomfret in 1802 (the oldest extant church building in the state) and the Congregational Church in Brooklyn, Connecticut, in 1808. Only two other foundries are known to have cast church bells in Connecticut after Hanks died in 1824. Lyon and Mix of New Haven made a bell for United Church in that city in 1827. The Veazey and White Bell Company of East Hampton (a town where many firms specialized in small bells) was the only firm in that area to cast church bells. It made one installed in the Asylum Hill Congregational Church in Hartford sometime between 1859 and 1882, when the firm was bought by Starr Brothers and the industry was already in decline. Edward T. Howe, Ph.D., is a Professor of Economics, Emeritus, at Siena College near Albany, New York. Hoopes, Penrose R. Connecticut Clockmakers of the Eighteenth Century. Hartford, CT; New York: E.V. Mitchell; Dodd, Mead & Co., 1930. Kelly, J. Frederick. Early Connecticut Meetinghouses: Being an Account of the Church Edifices Built Before 1830, Based Chiefly Upon Town and Parish Records. Vol. 1 & 2. New York: Columbia University Press, 1948. Wilcoxson, William Howard. History of Stratford Connecticut, 1639-1969. Stratford, CT: Published under the auspices of the Stratford Tercentenary Commission, 1969. Warren, Winthrop, and Christopher B. Nevins. “Clock and Clockmakers of Colonial Fairfield Circa 1736-1813.” National Association of Watch and Clock Collectors (NAWCC) Bulletin, October 1993. “Connecticut Church Bells.” Connecticut Historical Society Bulletin, January 1949. Warren, Winthrop. “Early New England Bell Founders.” Timepiece Journal, Fall 1992. Croswell, Frederick. “History of Trinity Church, New Haven.” Papers of the New Haven Colony Historical Society, 1865. Hotchkiss, Justus H. “New Haven Bells.” Papers of the New Haven Colony Historical Society, 1894. Loomis, Israel Foote. “The Town of Chatham.” The Connecticut Magazine, June 1899. Grounds for Divorce – Who Knew?